“Amazing”…“fabulous concert”…“so glad I came”… were just a sampling of the enthusiastic comments overheard in the lobby at last night’s season opener for the South Okanagan Concert Society. The Bergmann Piano Duo presented a delightfully diverse program which began with classical masterworks and progressed to arrangements from Broadway, favourite jazz standards and spirited South American tangos. The concert was not only a delight musically, but visually too. On stage were two magnificent grand pianos which Marcel and Elizabeth Bergmann brought with them on the first leg of their 2013/14 concert tour which includes stops all through BC’s Island communities, the Kootenays, and the Okanagan, before returning home for concerts in the Lower Mainland. The Bergmann Piano Duo’s performance for Oliver began with Mozart’s Overture to the Magic Flute which set the stage for the musical magic in store for the evening. A work by Brahms followed with its smooth flowing andante and playful vicace and con moto variations. The Bergmanns demonstrated the amazingly full, almost orchestral sound, which can be achieved with two pianos. Marcel Bergmann’s own arrangement of West Side Story completed the first half of the concert. It was a lively romp through Bernstein’s most popular work and at times held the sensitivity of a love duet, and at others, the raw passion of a duel. The second half of the program opened with Brubeck’s Blue Rondo à la Turk which not only showed the Bergmanns’ talent for having fun on stage, but the back and forth of the music created an almost stereo sound effect. Having set the tone, their eclectic program included compositions by the famed contemporary tango nuevo voice of Astor Piazzolla, renowned jazz pianist Chick Corea, and Brazilian composer Egberto Gismonti. It’s an impressive and all too rare treat to hear two such fine musicians playing on two grand pianos on the concert stage. Thanks not only to the Bergmanns for a fabulous concert but also to the generous loan of the pianos by Vancouver’s Showcase Pianos and to Salmon Transfer who for decades have generously been the piano moving specialists for symphony, small concert halls and festivals throughout the province. 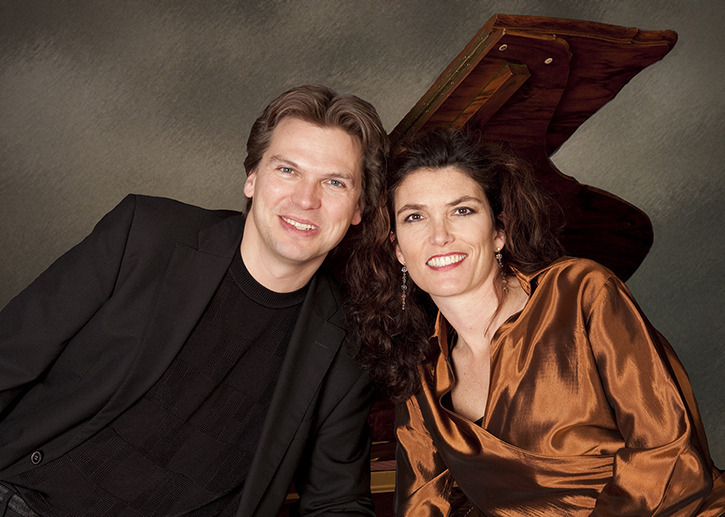 The Bergmann Piano Duo’s spirited and invigorating concert earned bravos and a standing ovation. They rewarded the audience with an energetic four-hand encore by Brahms. If you missed them last night in Oliver you can still catch them Saturday night in Penticton. Next up for the Concert Society is a group the National Post called “the most exciting small choir in the land.” Musica Intima vocal ensemble will perform in Oliver on Friday November 22nd. Series tickets are still available and single tickets can be purchased at the door. Don’t miss it! Having read this I thought it was rather informative. I appreciate you finding the time and effort to put this information together. I once again find myself personally spending a significant amount of time both reading and commenting. But so what, it was still worthwhile!